Anyone with a large dog knows what bloat is. It’s one of our biggest fears with Great Danes, but they’re not the only breed. Any dog with a large chest and narrow waist can fall victim to this deadly occurrence. I’m on the board of the Rocky Mt. Great Dane Rescue and we recently had a dog bloat at another board members home, where she was fostering her. Joy’s quick action and knowledge of the bloat acupressure point probably saved this dog’s life. As a kennel owner, I think it’s a must to know about this and have it handy in case of emergency. Apply pressure with the thumb for at least 30 seconds or slowly massage the point. 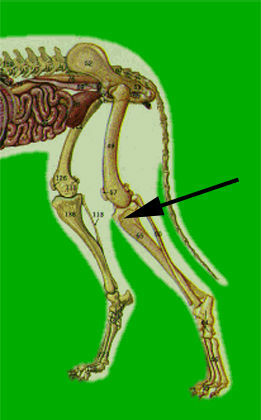 To find the point, start at the hock, on the front of the leg (anterior), and you can feel the tibia. Move your hand up the leg along the tibia’s sharp crest; what in humans would be called the shin. As your hand approaches the stifle, or the knee the crest becomes very pronounced and then curls around to the outside (laterally). Just inside this curve is a depression. The acupressure point is in this depression. Pressure or massaging stimulates the point. The gastrointestinal tract starts to contract and move (peristalsis) and expels the built up gas before torsion can occur. If torsion has occurred, massaging the spot will not help. Please note that this does not mean you don’t have to take the animal to the vet. All this does is stimulate gastrointestinal motility so that the dog can pass enough gas to relieve some of the pressure on the stomach, helping with pain and hopefully buying you enough time to get to the vet before the dog torques. Central Florida Great Dane Rescue has a pretty comprehensive list of bloat articles and information for further study.